Apple CEO Tim Cook provided a bit of color on the company's wearables business during Tuesday's shareholders meeting, saying combined Apple Watch, AirPods and Beats headphones revenue is nearing that of a Fortune 300 company. 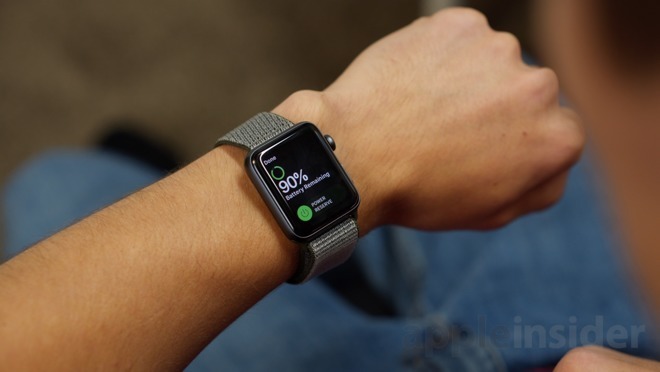 As usual, Cook failed to provide specific sales figures for any of Apple's wearable line, according to coverage of the event from AppleInsider's Dan Dilger. "I'm not a big fan of that word," Cook said, referring to the term "wearables." Whatever Cook wants to call it, sales of Apple Watch, AirPods and Beats are growing. Thought to be leading the charge, at least in terms of revenue, is the premium priced Apple Watch. A late entry to the segment, Apple has dominated the smartwatch industry since the first Apple Watch debuted in 2015. Driven by strong demand for Apple Watch Series 3, Apple Watch saw its best quarter ever in the recently ended first fiscal quarter of 2018, exhibiting 50 percent sales growth year-over-year. Over the same period, estimates from market analyst Canalys had Apple ship more Watch units than the entire Swiss watch industry, a first for any smartwatch maker. Beyond Watch, AirPods remain a hot seller and is consistently out of stock on Apple's online storefront. Cook also offered commentary on Apple Pay, saying, "Mobile payments have taken off slower than I would have thought." Apple's first-party payments product has experienced rapid growth over the past 12 months, Cook said, noting fast-paced adoption in Russia and China where PCs are being passed over for mobile devices. Apple Pay has also benefited from its built-in transit integrations, which have been a hit with commuters in Japan and the UK. Finally, discussing Apple's health initiatives, Cook said the company looks at medical devices as a benefit to end users without paying heed to whether the government will reimburse the contributions. This freedom allows Apple to develop advancements that would otherwise go undiscovered by firms primarily concerned about Medicare or Medicaid compensation. Spearheading Apple's health efforts are Apple Watch and a series of health-focused apps including Health, and the HealthKit, ResearchKit and CareKit frameworks.